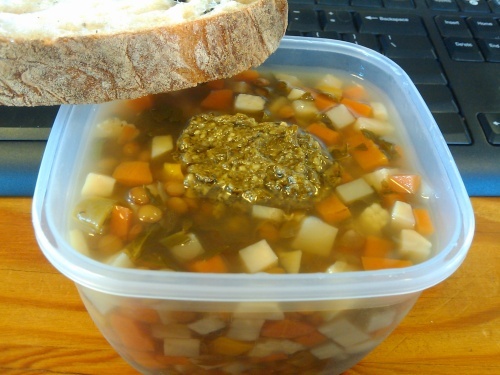 #423 - Vegetable Soup Lunch - Wots For Lunch? Recently Cape Town became one of a handful of cities worldwide to endorse a weekly meat-free day. I’ve blogged previously about the Meatless Monday movement and my strange mental block when it comes to creating a meat-free meal on a specific day of the week. So I’m happy to follow the City of Cape Town‘s example and enjoy a few random meatless days a week. This simple vegetable soup is a great vegetarian option for your chosen meat-free day. Cubed celeriac, carrot and any other vegetable odds and ends you’d like to make use of, cooked with lentils in a vegetable stock and served with a generous spoon of flavoursome pesto. a slice of olive ciabatta. This entry was posted in Packed Lunches and tagged baby corn, bread, carrot, celeriac, lentl, pesto, soup, sugar snap peas, vegetable soup. Bookmark the permalink. Loving it! and you are so right, the City’s idea is much easier to follow and makes sense in a normal home where rules are not always easy to follow. I’m all for planning ahead, but sometimes I want the ability to choose what to eat on a whim.